When I make baked goods for parties, I always prefer them to be single-serving sized, appealing to lots of people, and fun to look at. If I’m having friends, they’re going to expect some kind of Sweet Tooth creation and I don’t like to disappoint! 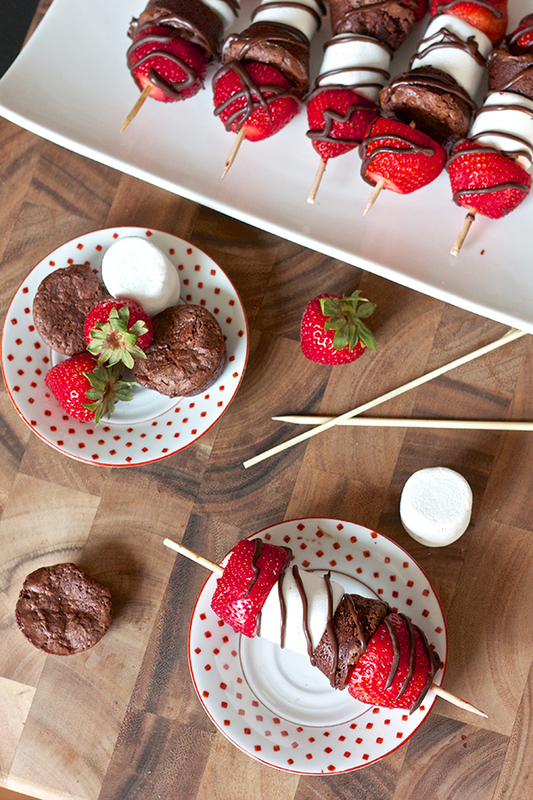 So I tend not to just serve a platter of chocolate chip cookies (although I’m sure no one would complain) – I like doing something a bit more creative, even if it’s as easy as putting some brownie bites, strawberries, and marshmallows on skewers. Kabob-ing is a popular summertime BBQ serving method, so I thought it would be cute to carry over this theme to the world of desserts with some in-season fruit as well. Kind of like the grilled berry pizza I made last summer! Since I’ve been so busy with residency and getting settled in the city, I wasn’t about to embark on a very involved recipe, and this one really couldn’t be easier. It’s less of a recipe and more of a suggestion for assembling some fun goodies together. I did have to turn the oven on for about 20 minutes to make the brownies, but it was well worth it! If you want to avoid your oven all together, store-bought brownie bites would work just as well. Even though I am the author of a baking blog and pride myself from making most things from scratch, I have to admit that I am obsessed with boxed brownie mix. I’ve whined about it here on the blog before, but I still can’t find a recipe that replicates the chewiness of boxed brownies. So of course I used a box for this dessert that I was in a rush to make, but I certainly wasn’t disappointed to have to turn to my friend Ghiradelli for this recipe. If you have a from-scratch recipe you love, please use that, but if not I totally won’t judge you from using a box! And another fun idea that I didn’t think of until after the fact – toasting the marshmallows with a kitchen torch would have been really, really cute and made these even more summery. Add this dessert to your next BBQ menu and have a great weekend! Preheat oven to 350 degrees and spray mini muffin tins with non-stick spray. Prepare the brownie batter according to the package's instructions and divide batter among muffin tins. Bake for 15-20 minutes, or until cake tester comes out clean. Allow brownies to cool in the pan for 5 minutes, then transfer to a wire rack to cool completely. Clean, dry, and cut the strawberries so both ends are flat (I just liked the look of them this way). 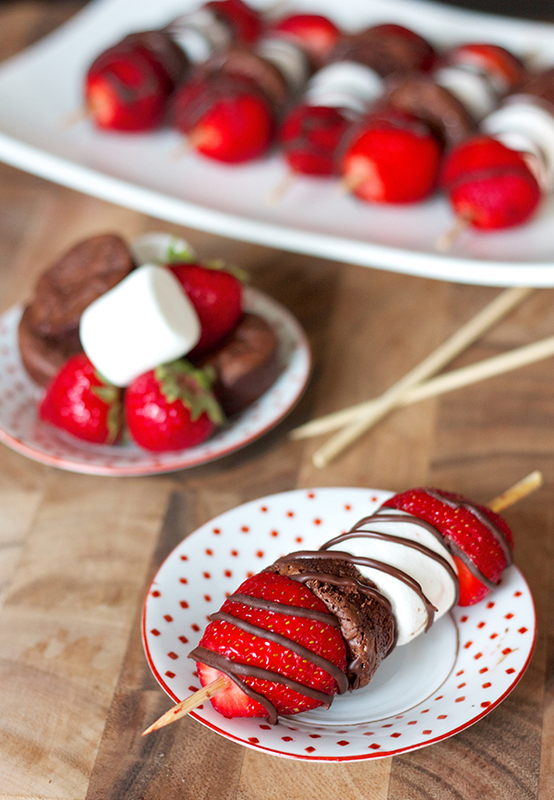 Layer the strawberries, brownies, and marshmallows on the skewers and lay them out on a wax paper-lined cookie sheet. Melt the chocolate in a microwave-safe bowl in 30 second intervals until completely melted. Transfer to a piping bag or ziploc bag with the corner snipped off and drizzle each kabob. Transfer to the fridge to allow the chocolate to set and until ready to serve. you just come up with such amazing ideas! Now I know what to do with the packet of marshmallows I have lying around. Glad that you are settling into life in NY. I’m sure everyone loved the dessert and hada fun time at the party. These are the best looking desserts! They look super easy, and so cute. Delicious recipe and very nice pictures!!!!!!!!!!!!!!! can you like send 500 of these to my house? oMg they look sooooooo good ! Oh, Hunnie.. I absolutely love your recipes but I got some news for ya.. If you thought our July was hot, wait til you see our August! I’ve tried using the grill for baking; let’s just say it wasn’t a great idea; these would be worth turning the oven on for a few minutes! Wow! This is such an incredible idea. :) Very creative kind of kabob. Never thought that this can be possible. HA HA. Yummmyyyyy! This makes me hungy. Ugh. 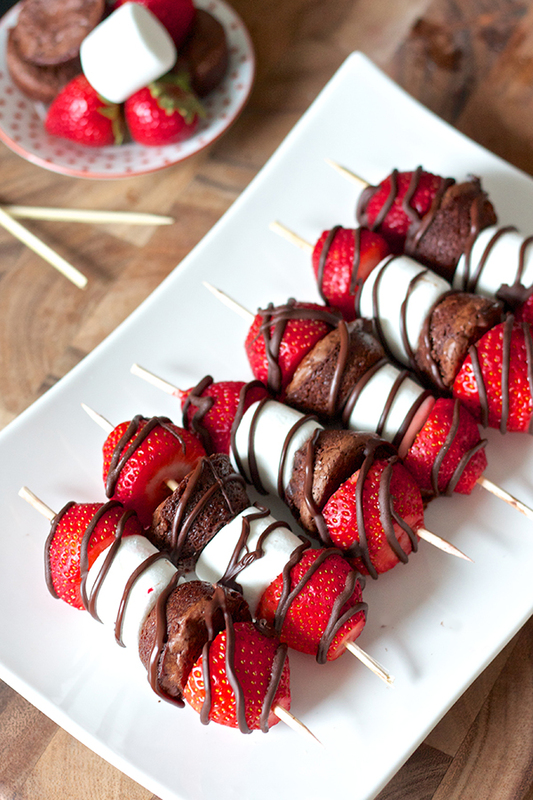 Strawberry Brownie Kabobs are adorable. What a clever idea! Definitely going to try these! one of the YUMMIEST things I have seen! Thanks, I will be trying this! These are beautiful and creative! Love them. These were amazing!! Made them last night for a dessert potluck and they were the hit of the party! Thank you! Do you bake the brownies as directed on the brownie box or only 15-20 minutes as you mentioned? Bake them for less time, like the 15-20 minutes I suggested, since you’re baking them in such small sizes. Good luck! Preheat the oven to 400 degrees. Line a 9×13 baking pan with foil or baking parchment, leaving some to overhang two opposite sides. In a medium saucepan over low heat, heat the chocolate and butter, stirring frequently, until melted and smooth and hot enough that you want to remove your finger quickly after dipping it in to test. Remove from heat and stir in the sugar, salt and vanilla with a wooden spoon. Add the eggs, one at a time, stirring well to incorporate each. Stir in the flour and beat with a wooden spoon or spatula until the batter is smooth and glossy and beginning to come away from the sides of the pan – about 1 to 2 minutes. If desired, stir in nuts. Spread the batter evenly in the prepared pan. Bake for about 15 minutes. The top will look dry, but a toothpick inserted in the center will come out wet with chocolate. Immediately place pan in refrigerator. When completely chilled, transfer to a cutting board. Cut into squares. Store in an airtight container for two to three days. What is an absolutely beautiful brownie, this is so very healthy and tasty. It took some time to get my kids to switch to real fruit drinks over soda but drinks like this have made it easy. We also use strawberries and raspberries for excellent weight loss in our dieting group. I made these for a charity fundraiser at work and they were a huge hit! One lady even bought 4 @ $1 each for her kids! Thanks for the great idea that attracted people to our hot dog/sundae sale and let us give a child a smile! Such a fantastic simple idea.. Here is a brilliant recipe for chewy gooey chocolate brownies..
How did you cut the kabob sticks? Did you use a scissors or knife? How many days in advance can these be made and kept in fridge? I just used scissors, but be sure to be careful because sometimes one end can fly off! And they can probably be made about 2 days in advance kept in a container in the fridge – although I would worry about the strawberries bleeding a bit to stain the marshmallows if left too long. I made them the night before and they were fine! I really want to make these for a Valentine’s party, but worried about how long they can sit out. I will need to have them out of the fridge for probably 3-5 hours. Think they’ll last ok with the chocolate drizzle on them? Thanks! I think that’s fine, just store them so the strawberries aren’t actually touching the marshmallows or else the juices will bleed. You can squeeze everything together right before serving. Enjoy!! Fill out the form on my contact page – http://www.ericasweettooth.com/contact. Thanks for letting me know! hi! Just saw your recipe. Here’s an idea for those hot days. Buy the 2-bite brownies. Instead of melting the chocolate just use chocolate ice crwm topping. I’m not sure if the chocolate would harden though. Can you make these and leave in fridge over night? Or do you think they will get to hard or soggy? The strawberries might make the marshmallows a little bit soggy overnight, just make sure the strawberries are as dry as possible, and if you want to spread things out on the skewers a bit before storing them in the fridge, you’ll less likely to get any sogginess. I would recommend getting everything all prepped before the night before, you can refrigerate the components, then quickly assemble them the day of. Good luck! It’s really quick and easy to make.